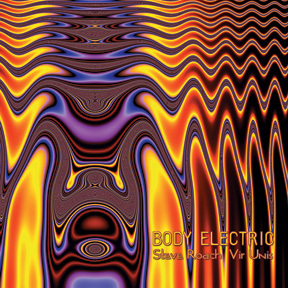 The music on Body Electricmelded together, relying heavily on what Steve calls "the body clock," a sense of timing and flow both artists turned towards in shaping the music that evolved from their collaboration. "Chance" situations were explored and combined in an alchemical reaction, often setting a piece in motion – opening yet another zone of sensation to explore. These chance combinations created a powerful and intimate symbiosis for both artists, so powerful that they termed it their "mind link."